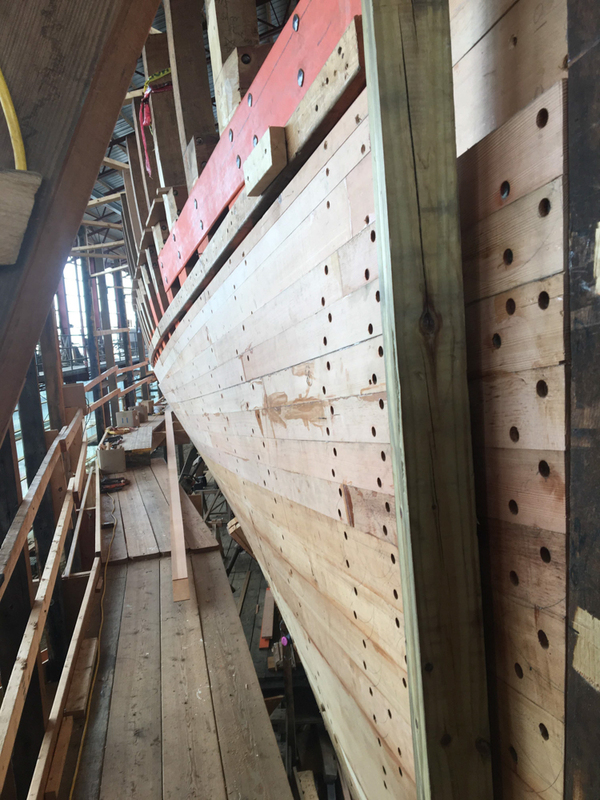 The upper half of Coronet is double planked, meaning that there are 2 layers of planking, one on top of the other. 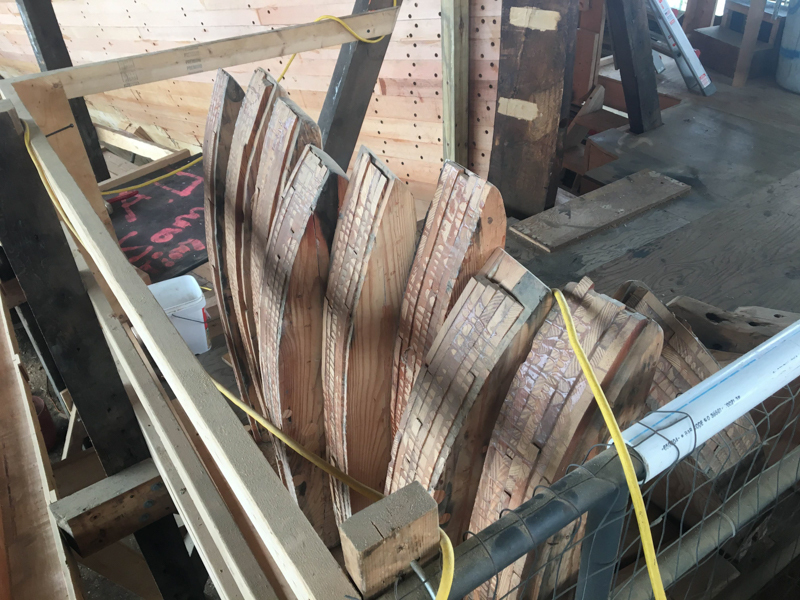 The layers are arranged such that the outer planks cover the seams of the inner planks. 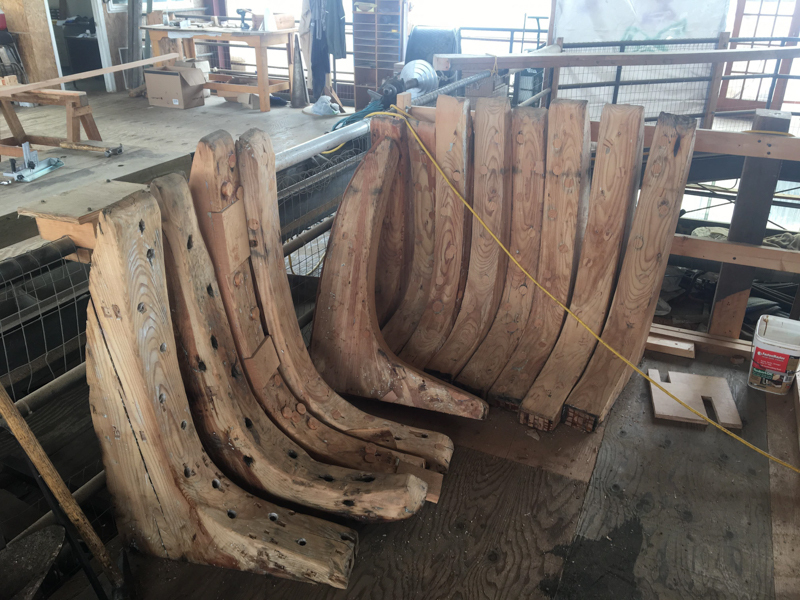 Traditionally the layers of planking are glued together with thickened shellac, but that’s because they didn’t have epoxy. We have epoxy, and that’s what we use. Here you can see 2 inner layers of planking. 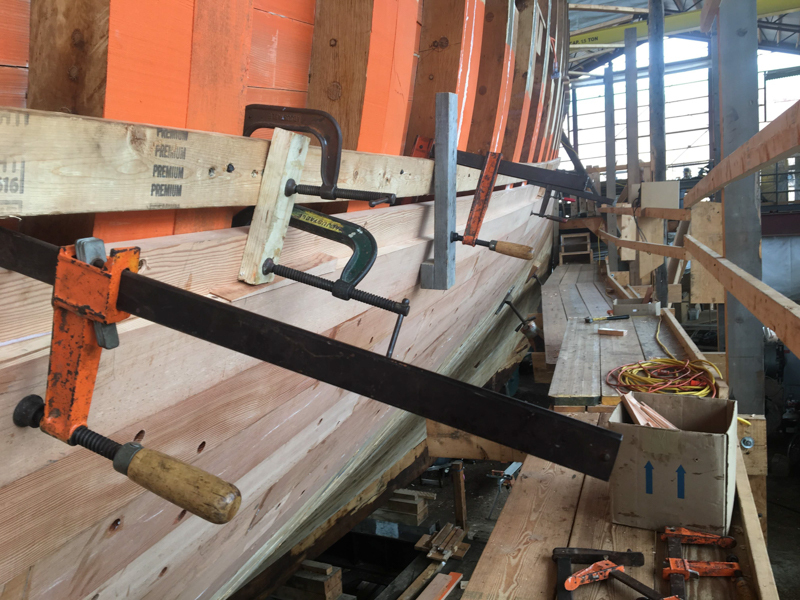 The next layer of planking will go halfway up the top strake of the inner planking and bury the seam. 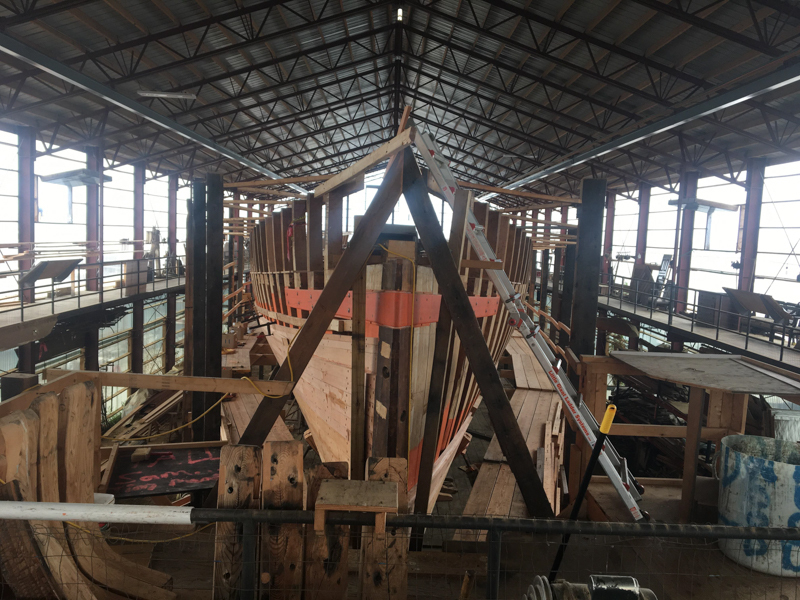 The plank lines have been laid out (the black lines on the outside of the frames) to guide the plank installation. 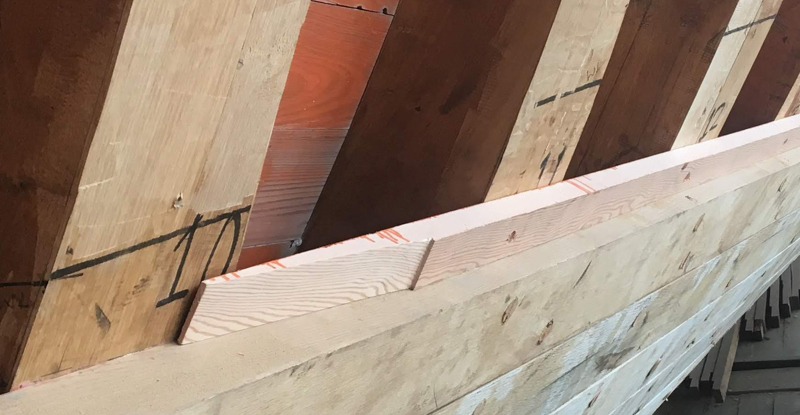 The boundary between the lower carvel (single thickness, traditionally caulked) planking and upper double planking is marked by a half-height layer of the inner planking. 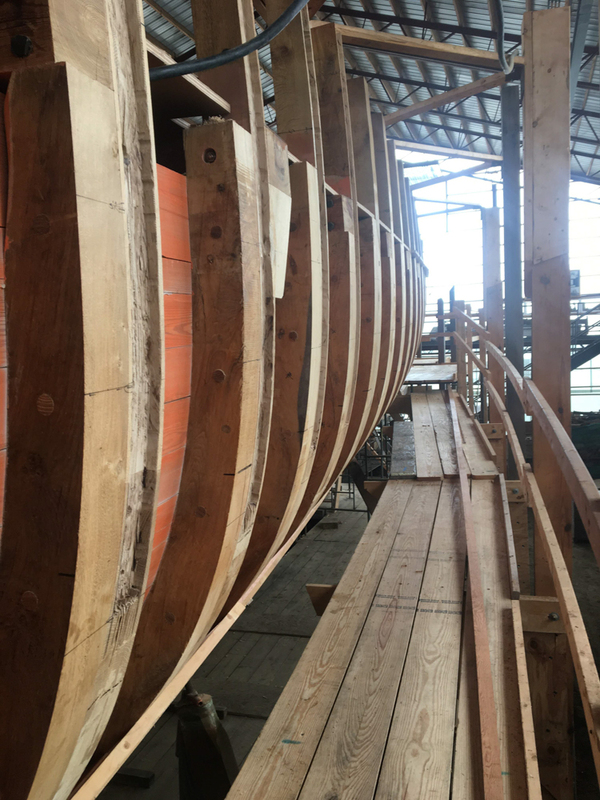 The ends of the planks are scarfed together to make one continuous plank the length of the boat. You can see the scarf joint here. 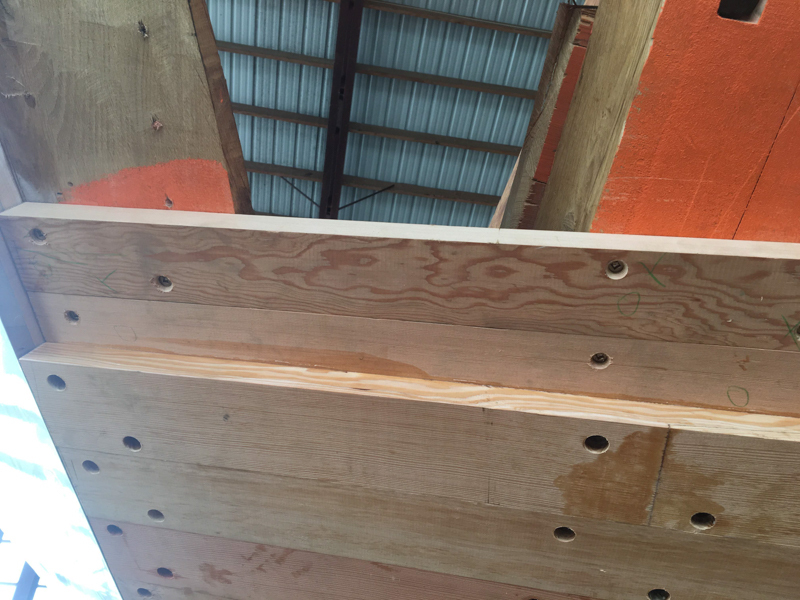 Since the ceiling has been installed, you can’t clamp the planks directly to the frames. Instead, the crew gets creative with a variety of clamps and 2×4’s. The crew has been trying to save as many of the original knees as possible. After they were removed from the boat, they were surveyed for rot and checks. Those that passed were patched up with dutchmen as needed and the fastener holes filled in with wood trunnels. If a knee is too far gone, it’s replaced by a laminate. However, these are done quite cleverly, and the final product does not look like a laminate. If you look closely at the previous photo, you’ll see that some of the knees have had a layer of wood laid down along the curved face of the knee, giving it the look of a solid piece. You can see the lamination at the very base of these pieces. 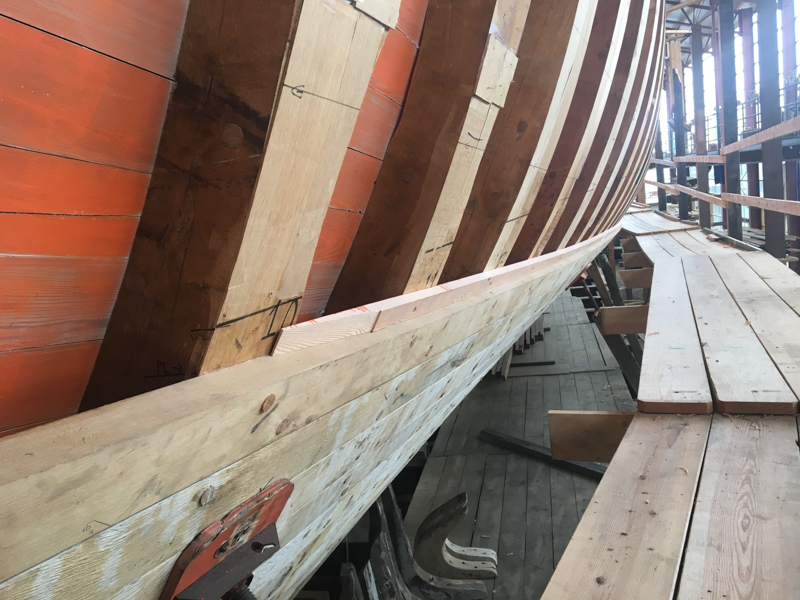 Looking at Coronet bow-on, the starboard planking has progressed a good bit more than port. Not much has changed on the interior since the last post. The sole bearers are in as well as the ceiling. It’s impressive. I hope to get up to the boat again soon. 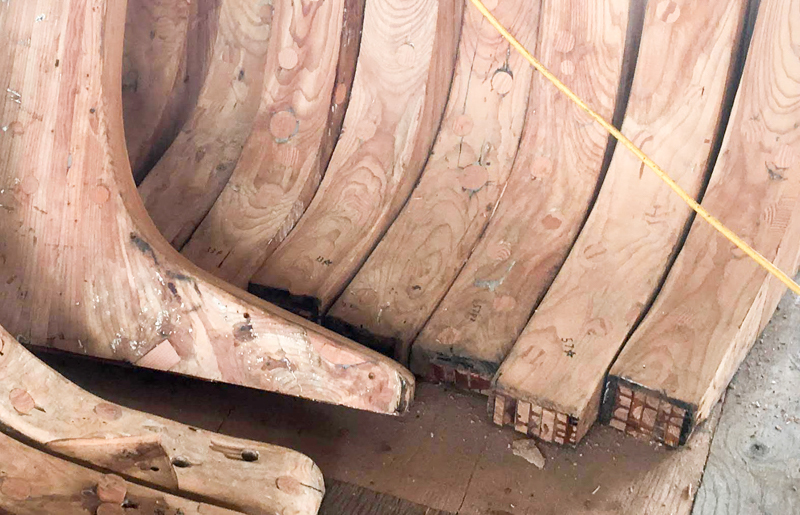 Did the Coronet arrive at the International Yacht Restoration School stripped? If so, where are those artifacts stored? I have some family history with this vessel and am just curious. I believe she arrived intact, possibly without her rig, I’d have to check. All of her panelling, stained glass, and other furnishings have been removed, catalogued, and stored. 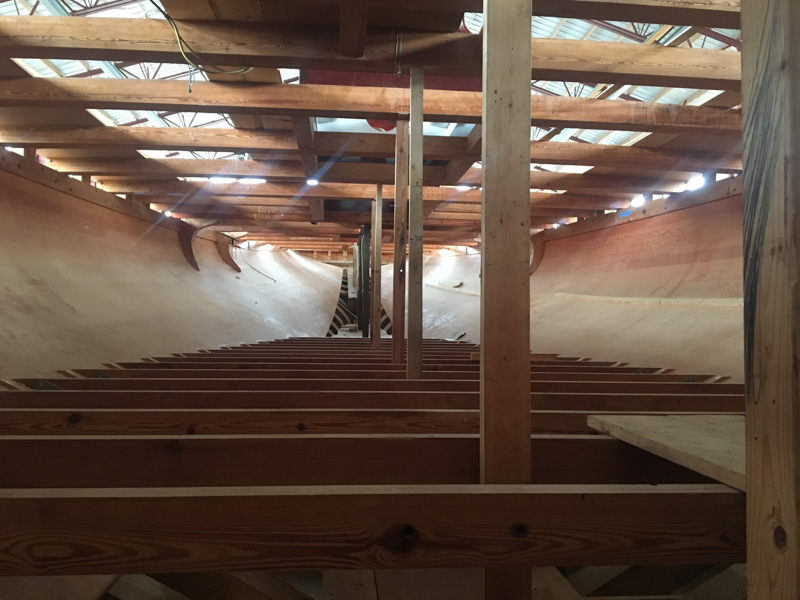 A few things are arranged along the catwalk around the boat, but most are stored offsite. I don’t think that the offsite storage is open to the public. What’s the status of the project. Just found out about this project from ultimate restoration. Is it labor you need? I sandblasted and ran plural paint equipment in the shipyards at San Diego for two years. Nothing close to what you’re doing, but I’d come out for a week of vacation to help out as much as I could. Really hope to see this amazing project finished. You guys are amazing. 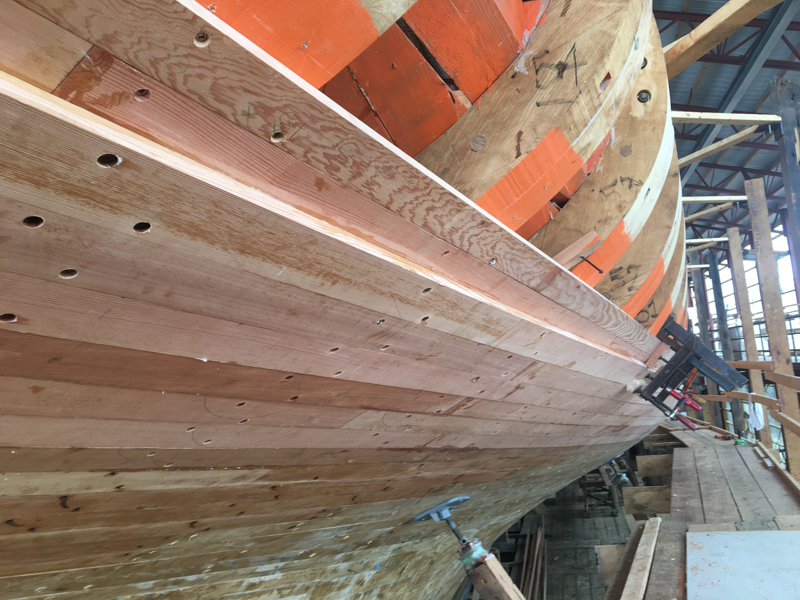 Hull planking’s finished up, most work happening in the summer now. Labor isn’t the issue, but thanks for your offer to help! Hi, I’m really glad to see the restoration continuing. I was worried it was abandoned after the long absence of updates. I am very familiar with her as she was docked in Gloucester next to my friends father’s dry-docked boat which we were working on each spring. I never asked to go aboard as people came an went as it was clearly their home. There were middle school aged girls heading to and from the boat to school and I remember an adult male coming and going always dressed in black. When I got older and had my own boat, I often crossed her bow as I went to and from the inner harbor and have a few snapshots circa 1975. I could send them along but I’m sure you’re not hurting for photos. Later in the 70s she would anchor in the outer harbor near Babson Ledge for the summer but I never saw her actually move. I’m sure she was towed to and from. I really hope to last long enough to see her sail again in all her glory! Keep on plugging!